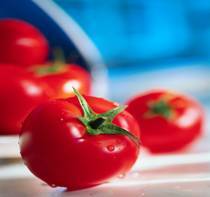 Tomato Facts, an information sheet for kids cooking activities. Tomato facts and general information about tomatoes. When planted in late spring tomato blossoms will grow into green fruit and will ripen red by mid summer through September or the first frost. Tomatoes grow from a seed. They need lots of warm weather, water and sunshine. You can also buy them light red color and let them ripen after buying. Store at room temperature not in the fridge. Remember tomatoes originate from warm southern temperatures and they like to stay warm. Chopped or pureed in sauces or soups or diced in salads, salsas, dips. Eat as is. Tomatoes are a source of Vitamin C and Vitamin A. They are also high in Lycopene which helps fight heart disease and some cancers. Make tuna salad by mixing tuna, mayonnaise and chopped celery in a bowl. Cut tomato in half on top lengthwise by the stem. Scoop out pulp, leaving a ½ inch shell. Spoon tuna mixture into tomato shells place on a baking sheet and broil 3-4 inches from the heat for 4-5 minutes until heated through. **You can try chicken salad instead of tuna, if desired. This recipe is very much a taste as you go method. Start with the number of tomatoes you'd like to use, then add one onion, 1 can of green chilies, 2 garlic cloves and ¼ teaspoon salt and then taste to see if you'd like more flavor. This is a good way to let kids experiment and create their own version. 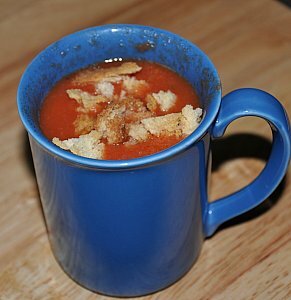 Try making homemade tomato soup! This makes a great side dish or snack. In bowl, add cottage cheese and tomatoes. Season with salt and pepper. Serve. Easy, simple and delicious. Dice 4 cups very green tomatoes. Try to take out all the seeds so you just have the meat. Do not add water but slowly bring to a boil stirring often because it can scorch easily. Stir well and allow to come to a boil. Remove from heat. Add this mixture to the tomatoes and stir until sugar is dissolved. Cool mixture while preparing pie crust. Place mixture into pie crust bottom. Dot top of mixture with 3 dots of butter. Top with crust and cut breathing slits into the top crust. Sprinkle top of pie with cinnamon sugar. Bake 450 degrees for 30 minutes. Before baking, cover the pie edges with a strip of aluminum foil to keep the edges from over baking. Remove foil the last 5 minutes of baking. Serve hot with vanilla ice cream or cold. My friend says this is to die for and toward the end of the summer I still have a lot of green tomatoes. Back to Food Facts from Tomato Facts.